Melt in your mouth, creamy chocolates in individual foils for the season. 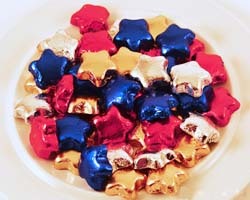 Christmas foiled stars are a great item to keep on hand for holiday guests and to enjoy with the family. Dorothy's foiled chocolates are delicious! From Linda Flister of St. Augustine, Florida on 12/26/2016 . From Anonymous of Lebanon, , Pennsylvania on 11/20/2016 .